Restaurant.com just released a new 80% off promotional code. Just use the coupon code DEAL at checkout and get 80% off. This means you can get a $25 gift certificates for only $2! I love these for date nights or gifts. Head over to Restaurants.com and enter your zip code to see the restaurants available in your area. This offer is good now through June 13th. Coupons Jun 9, 2011 in entertainment, family, RestaurantsDotCom · Expired! From April 11-14th, you can get gift certificates to Restaurant.com for as low as $2. They are having an 80% off sale this week. This is the perfect time to grab a few and try out new restaurants. I always check out the available restaurants, read reviews, and then pick a few to try. We also hold on to these when we know we have company coming to town, it really saves a ton of money. How often can you eat out for only $2? Make sure you read the fine print for each restaurant you select. If you have an upcoming trip, check out those locations too. 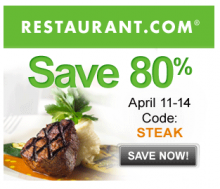 Head over to Restaurants.com and check out the 80% off sale. Add the restaurants you want to purchase to your cart and use code STEAK at check out. This offer ends on April 14th! You can also get 25% cash back when you make your purchase through Shop At Home. Offers Apr 11, 2011 in food, RestaurantsDotCom · Expired! 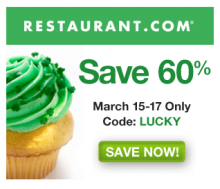 Head over to Restaurants.com and get certificates to your favorite restaurants up to 80% off! Use code Lucky at check out. This offer is only good March 15-17. I’ve noticed new restaurants added for our area so make sure you check it out if you haven’t in a while! Offers Mar 15, 2011 in RestaurantsDotCom · Expired!